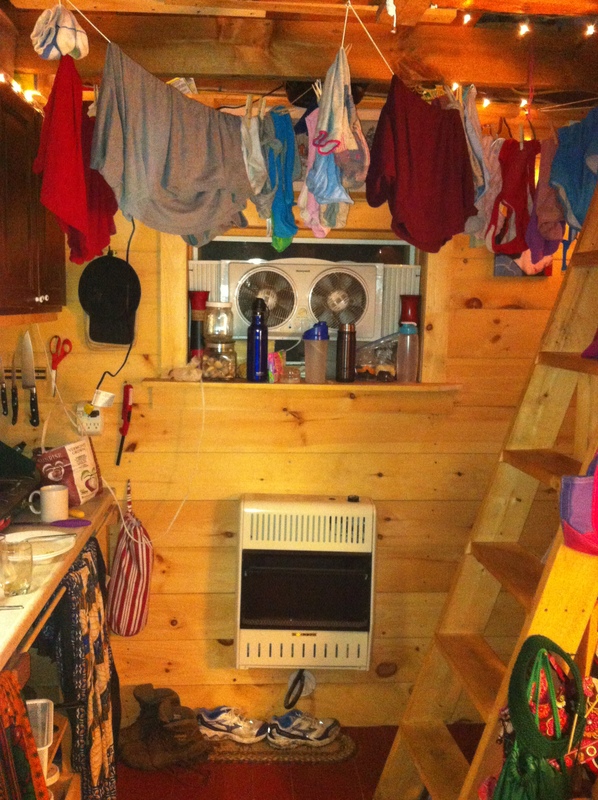 One of our favorite things about living in a tiny house is that it is cheap and easy to heat. I’ll write a post later about the ins and outs of our heating system, but for now just some basics. We have a 20,000 BTU wall mounted propane heater, that takes our house from 40 to 70 in less than 10 minutes. Last winter, I burned about $120 worth of propane, though it may be slightly higher this year with two of us living here. The heater is perfect because we can leave the pilot light on while we are asleep or gone for the day and it keeps the house above freezing. Then we crank it when we get home and it’s warm and cozy in moments. The complaint I’ve had with our heater is it doesn’t have a built in fan. In addition, I chose not to weather strip our front door (out of fear of our house being too tight) resulting in unequal distribution of heat between the downstairs and sleeping loft. The heat rises from the heater and the loft becomes hot while downstairs (especially near the floor) stays cool or even cold. In the past I’ve kept a fan in the opening to the loft to blow the hot air back down, but we want to be able to circulate the hot air without blocking the entrance to the loft. So once again I started brainstorming. How could I get the hot air down to the floor? I decided to take our $15 Walmart fan from beside our bed and attach it to the ceiling (or technically to the side of a loft floor joist) just above the heater. The photo above takes a bit of imagination, but let me walk you through it. Imagine you are laying down on the floor of our house with your feet towards the front door and your head under the heater. 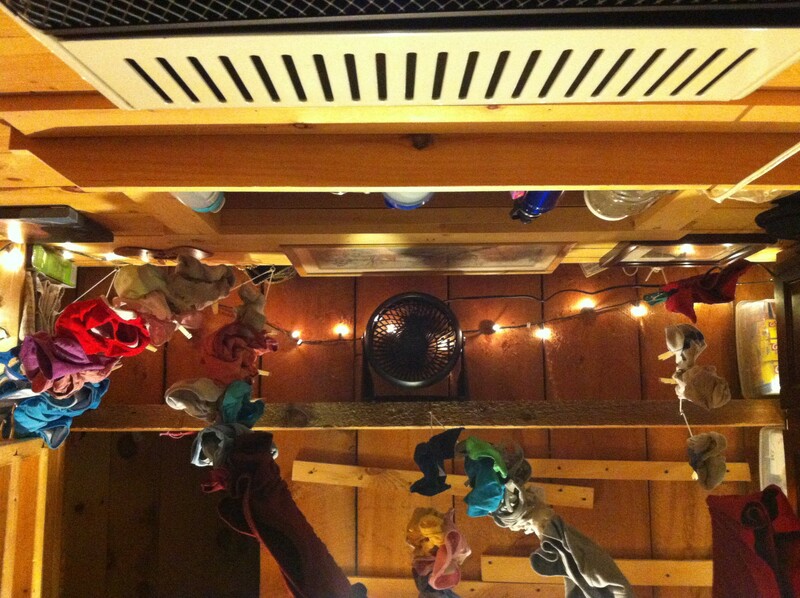 At the top of the picture (the top of your field of vision) you can see our heater, and glancing down the photo you can see the underside of the windowsill, then the window opening. Keep following and you can see a picture hanging on the wall above the window, then the first bay of our ceiling where I mounted the fan. Not only does it keep the warm air down, it drastically shortens the drying time of clothes on our lines in front of the heater. In case that photo makes you dizzy, below is a right-side-up shot of the same wall from the entrance of our house. Brilliant, Jamie — that’s a great solution to the cold feet syndrome!